Supporters of ranked choice voting deliver petitions Friday, Feb. 2, 2018, at the State House in Augusta, Maine aimed at thwarting a legislative delay and putting the voting system into place for state primaries in June. AUGUSTA, Maine — Proponents of ranked-choice voting appear poised to get their effort to preserve the voter-approved system on the June ballot. If they do, it’ll have an immediate impact on another, perhaps more crucial, election at the same time. 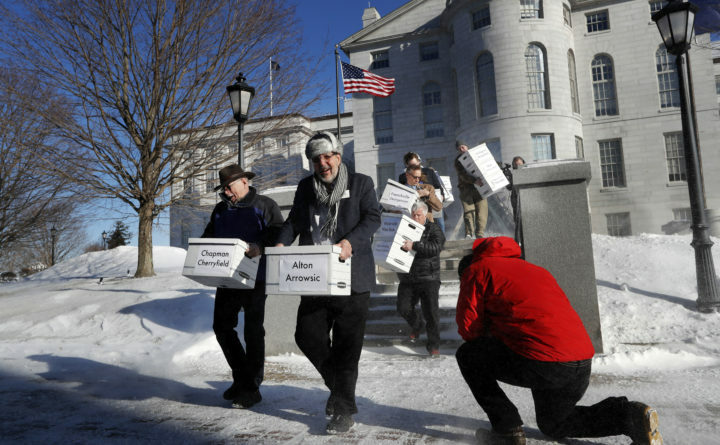 On Friday, advocates submitted an estimated 72,000 signatures to Maine Secretary of State Matthew Dunlap’s office to place a people’s veto referendum on the June 12 ballot. It would overturn parts of a law passed last year to delay the implementation of ranked-choice voting until 2021. If Dunlap’s office certifies the signatures, Maine voters who backed ranked-choice voting in 2016 will decide whether to keep it in place for primary and federal elections. But it will also delay the 2017 law’s implementation, putting ranked-choice voting in place for the June primary. That primary will be massive: Twelve Democrats are running now to replace the term-limited Gov. Paul LePage alongside five Republicans, and they are set to be the guinea pigs for the new ranked-choice system, which may cost four times the amount of past primaries. Here are the things that Friday’s events set in motion and what it means for the primary. Dunlap has until March 5 to certify the signatures. Ranked-choice voting proponents needed approximately 61,000 signatures to place the people’s veto on the ballot. Barring a disaster with certification, they will qualify. That would trigger a delay of the law undercutting ranked-choice voting … minus key parts. If they get on the ballot, parts of the 2017 law are delayed and Mainers will vote on June 12 about whether to permanently toss out those parts of the Legislature’s 2017 bill. But simply by earning a spot on the June 12 ballot, the people’s veto — even if it fails to pass — will have the crucial impact of restoring ranked-choice voting for party primary contests to be decided the same day. The Legislature delayed the law because the Maine Supreme Judicial Court said last year that ranked-choice voting is unconstitutional for state-level general elections. But the courts have not offered an opinion on it in primaries and federal elections and nothing seems to preclude it. So, the people’s veto only proposes implementing ranked-choice voting for primaries and federal elections, not for state-level general elections. The November elections for governor and the Legislature will be conducted as usual — the person with the most votes wins. The Legislature may have to provide a lot more funding for ballots to be counted in a timely fashion. Now, primaries cost about $250,000 for the state to run. But Dunlap’s office estimates that the ranked-choice primary will cost $1.1 million to do under “best practices,” including the purchase of upgraded tallying equipment. That’s because designing a ranked-choice system is a logistical hurdle. Now, the public learns about the results of elections on election night because of unofficial reports from municipal clerks to media outlet. But ranked-choice voting will throw a wrench in that. In ranked-choice races with three or more hopefuls, a winner is declared if a majority picks someone as a first choice. If not, the candidate with the lowest share of first-place votes is eliminated and their second-place votes are reallocated, a process repeated until a majority is won. While clerks may report first-place votes the same way they do now, we’ll only know the winner of an election if they get an outright majority. Further rounds of vote tabulation would be done by Dunlap’s office in Augusta, but only after the Maine State Police transport ballots there from every community in Maine. Top legislators look ready to fund the system. But for now, Mason said “we have to implement it the best that we can,” although he wants to learn more about why the extra funding will be needed. Dunlap said he may submit that request for $1 million or more by month’s end if the people’s veto effort qualifies. Rep. Louis Luchini, D-Ellsworth, who co-chairs the voting committee, said it would be “horrible” if results of elections aren’t known for weeks. “We have to maintain the public trust in the process,” Dunlap said.